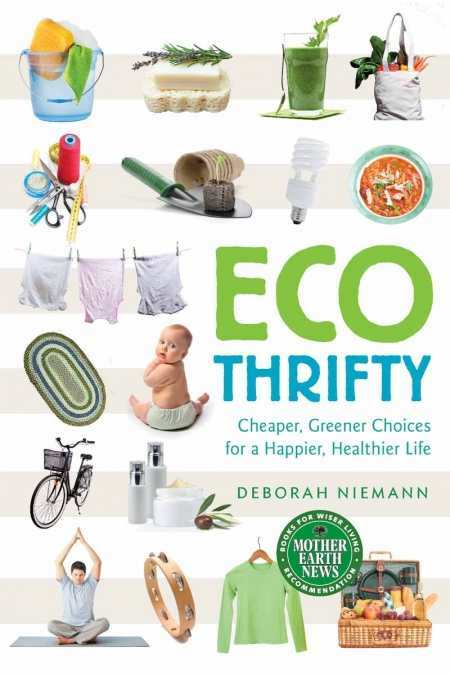 “You are misinformed,” Deborah Niemann states early in the introduction to Ecothrifty, countering the many time- and cost-related excuses people use to keep from doing what’s good for them and the planet. A homesteader and self-sufficiency expert with years of wisdom behind her, Niemann covers all topics—from simple things like cooking more meals from scratch to more complex issues, such as choosing transportation and methods of entertainment—with a no-nonsense tone and personal anecdotes that show us the easy errors of our me-focused ways. Using facts that often stun (“While we complain that we don’t have any time, we are watching television between almost three and five hours a day”), Niemann calls readers to action and provides both the tools and encouragement to help us live healthier lives, saving money and the planet to boot. In each of the ten subject-focused chapters, the author provides necessary background to encourage a switch, laying out how the “normal” (aka “marketed”) lifestyle choice harms people, the planet, or both, while also sucking up a lot of cash. Each chapter also contains a careful breakdown of the subject, with must-have information to help readers put their new-found knowledge into action. In the personal care products section, for example, Niemann explains different kinds of natural oils, butter, and waxes before moving on to making soap and moisturizers. Additionally, she furnishes readers with simple recipes throughout the chapters (all easy to find, as well, through the convenient recipe index). Perhaps most importantly, as it is key to her cost-saving approach, Niemann provides a savings section in which she profiles the cost of conventional products against the homemade versions. Her numbers are easily convincing. She also provides tips in easy-to-spot sidebars, on such topics as why sponges shouldn’t be used for cleaning, how to find free stuff online, and why coupons aren’t really helpful. To encourage readers, she includes insight from others who are eager to share how they live sustainable lives. Niemann’s personal narrative about growth and change, coupled with her can-do attitude, helps readers see that sustainability is a process of trial and error—and that those discoveries can be fun. Short, to-the-point chapters, easy recipes, and the cost-savings breakdowns all add up to a book that puts action at readers’ fingertips. Ecothrifty is perfect for all people interested in pursuing a more sustainable life, from those who have contemplated it to those who are already on the greater path to sustainability.